The husband of the woman found dead in a Sussex home on Friday has paid tribute to her, police has confirmed. In a statement, police added: "Although formal identification is yet to take place, the woman who was found dead at a house in South Farm Road [Worthing] is believed to be 35-year-old, Maryna Kavaliauske." Her husband of 15 years, Giedrius (pictured with his wife), said she was a 'wonderful mother to their two children, who are nine and 12, and that they were a very happy family'. The police added: "The family have asked for their privacy to be respected at this difficult time." The man also found dead at the house is believed to be Viasia Chernoff, known sometimes as Alex Chernoff, who was 43, police confirmed. The statement confirmed the pair were known to each other but not related, it added: "A post mortem carried out on Saturday (April 14) established Maryna died from ligature compression to the neck and Viasia died from hanging." 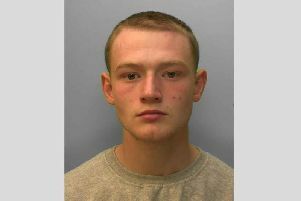 Detective superintendent Adam Hibbert, of the Sussex and Surrey major crime team, said: “At the present time we are not looking for anyone else in connection with the investigation and our enquiries are continuing to establish the full circumstances of the deaths. "I would discourage anyone from speculating as to what has happened as we have a distraught family with two young children trying to come to terms with their loss and to start grieving. "Our thoughts are with the families at this difficult time." Anyone with any information about the incident is asked to report online or call 101 quoting Operation Assert.